Small-Sized Telescopes (SST) are designed to research a wide range of energies between a few and 300 TeV. They will outnumber all other telescopes and will spread out in the southern observatory over the area of ​​several square kilometers. Three different SST implementations are being prototyped and tested. 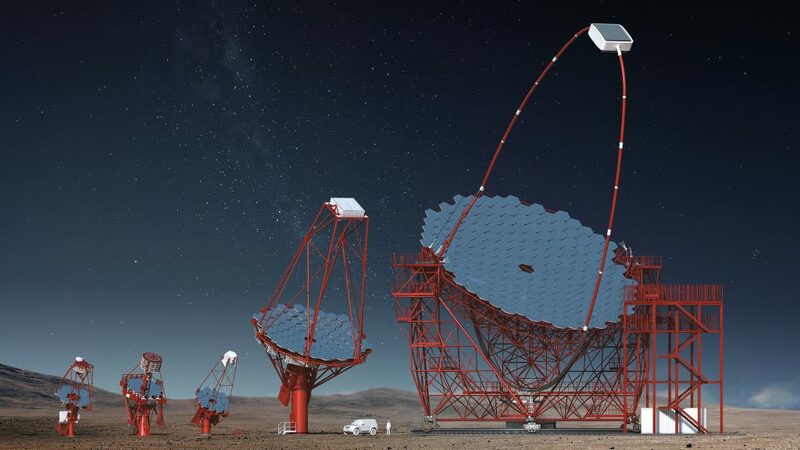 Medium-Sized Telescopes (MST) will be CTA’s “workhorse” due to their sensitivity to the faint energy flux of gamma rays. Their sensitivity ranges in the core energy range between 100 GeV and 10 TeV. Its large field of view of 7-8 degrees will enable the MST to take rapid surveys of the gamma-ray sky. There are plans to build 40 medium-sized telescopes out of which 25 will be located in the southern hemisphere and the remaining 15 in the northern one. Large-Sized Telescopes will be located in the middle of observatories in the northern and southern hemispheres. This class of telescope types will cover the unique range of energy types between 20 and 200 GeV. The entire structure will weigh 100 tons but will be extremely mobile, with the goal to change position within 20 seconds. Three types of telescopes of the Cherenkov Telescope Array. From the left, 3 construction prototypes of the Small-Sized Telescope (SST), Medium-Sized Telescope (MST), and Large-Sized Telescope (LST). Each type of telescope serves a unique function in the role of the observatory.